Change is constant. Natural ecosystems’ and organisms’ ability to adapt is a prime example of how change is the driving force for long term sustainable strategies. The United States financial infrastructure has its foundation in Gross National Product that is volatile, unstable, and embrace many stagnant limitations. Bio-inspiration and bio-mimicry are science and business institutions that observe nature to copy their designs and techniques. The Circular Economy Principle is a revolutionary trend that is riding on the changing winds to establish a course towards a resilient, adaptable model for long term stability. Creating a stable, well rooted economic foundation is a sound intention whether you manage a home environment or oversee a business ecosystem. Single-celled organisms were severely challenged to survive on the vast, poisonous landscape in geological history. The life forms were opportunistic to find resources, adapted for success, and passed a lifetime of change to successive generations in the evolutionary process. An organized process of exchanging elements and forming collaborative relationships has resulted in the complex world that provides for your survival. The amazing functional interrelationships involves an exchange of resources that continuously cycles through communities specialized on utilizing the outputs from other communities. For example; a magnificent tree grows its roots into the ground. Old tissue is shed during the growth process. This tissue becomes a food source for fungi as they pass on the discarded elements that supports a rich community of underground populations. The community dynamics is cohesive in a sustainable design for success. In contrast, humans have created an infrastructure where the Great Depression and Great Recession are testimonies to an unstable, volatile system. Outlined by the Gross National Product (GNP), success is determined by the final goods and services produced in a one-year period. Success and growth are dependent upon creating more goods and services and increasing the population numbers so more people can purchase the increasing number of products. Goods are generated by harvesting materials that are manufactured and transported to distribution venues. At the end of life, the products become waste and pollution while being discarded or burned. This linear, one-way flow through system creates a stagnant pool of valuable elements and resources that houses an abundant source of wealth. The Circular Economy Principle mimics natural systems with the premise that the output from any process serves as a resource for another community process. Strategically managing the flow of materials and resources is a testament from taking insights from living systems to develop a collaborative network of interrelationships. Re-purposing output eliminates the end of life waste and pollution to establish a ‘cradle-to-cradle’ resource cycling, man-made ecosystem. Embracing a non-linear, feedback-rich, and interdependent infrastructure cycles the very elements that fuels the survival of a diversity of life forms, businesses, and lifestyles. The San Francisco city managers recognized the value in organic wastes by requiring all residents to compost their organic material or pay a fine. Natural ecosystems have survived on Earth for billions of years in a process of designing sustainable functioning ecosystems. A cycling of elements becomes a resource in a series of community interactions. Humans developed a linear, flow through of supply that ultimately depletes it reserves and creates a burgeoning accumulation of stationary wastes. The limited amount of space available on Earth is evidence of this folly of design. 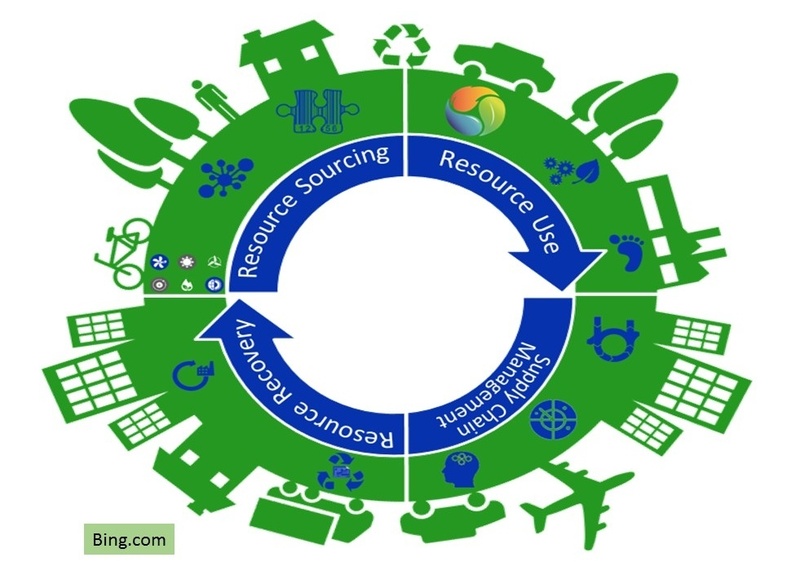 Recognizing the eloquent movement of value-based essentials through compartmentalized functioning ecosystems, the circular economy principle is a strategy for success. Adapting to a changing climate of feed-back loops provides an opportunity to accept nature’s qualities to redesign our lifestyles, businesses, and government. Embrace change and adapt for the development of a Sustainable World.